The Cares Family is a group of community networks of young professionals and older neighbours who support and socialise with one another. We exist because, while our cities are exciting, dynamic places – full of cultural and economic opportunity – they can also be isolating, anonymous and lonely. bridge the gaps across social, generational, digital, cultural and attitudinal divides. Social Clubs are regular group activities bringing people together to share time, laughter and new experiences through get-togethers like dance parties, film nights, new technology workshops, dinner parties, business visits and more. A Love Your Neighbour programme matching older neighbours and young professionals to share friendship one-to-one, often in people’s homes. Friends share a chat and a cup of tea, and those who can often visit the theatre, a local cafe or go to a football match together. 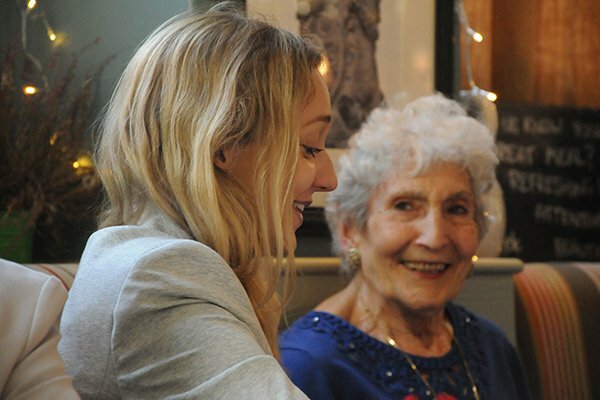 Outreach to help people into the community – by pro-actively identifying older neighbours who could benefit from new interactions where they are. An annual Winter Wellbeing project, for instance, helps older neighbours to stay warm, active, healthy and connected during the most isolating time of year. Community Fundraising helps neighbours to contribute to their network in additional fresh, involving ways. Older and younger people raise money together through challenges, events, corporate partnerships and by making regular donations. North London Cares and South London Cares began as small community organisations in their home boroughs of Camden and Islington, Southwark and Lambeth, and have developed into major sister networks with a growing profile and reach across London and beyond. They grew organically from the grassroots, seeking to understand and respond to the community in real time. Now, as we look to the future, the Cares Family are seeking ways to expand the model into other big cities, to help more people feel part of a rapidly changing world, rather than left behind by it. 68 per cent have had low wellbeing since getting older - of these, 38 per cent say the lack of social contact is the main barrier. 86 per cent felt more able to appreciate the world. 97 per cent felt that they were more able to appreciate older people. The evaluation found that, generally, individuals reported a greater sense of community engagement. However, these answers may have been influenced by individual cases, such as people going to the GP every day on account of certain conditions. The Cares Family has identified that there is a need to expand to other major urban populations in the UK who are experiencing a similar pace of change and conditions which cause isolation and loneliness.